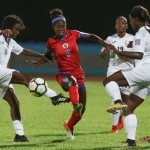 After two years without an international victory—a run that includes the tenure of three coaches—the Women Soca Warriors stretched their winning streak to five matches last night, downing Dominica 3-0 in their second France 2019 World Cup qualifying encounter at the Ato Boldon Stadium in Couva. Photo: Trinidad and Tobago wing-back Patrice Superville (left) tries to drive a cross past Dominica defender Kira Bertrand during 2019 World Cup qualifying action at the Ato Boldon Stadium on 21 May 2018. But reunited with senior players with whom he has worked for well over a decade, such as captain and playmaker Tasha St Louis, defender Ayanna Russell and midfield lynchpin Karyn Forbes, Shabazz’s sense of relief—and even optimism—was unmistakable. Three months ago, the coach told Wired868 that his current team lacks the depth to qualify for France and he intends to focus on developing a force for the future. Last night, he modified that sentiment ever so slightly. 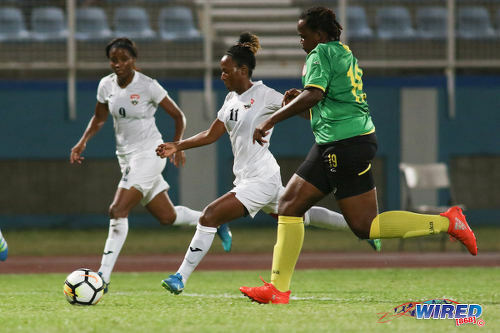 Yet, at the risk of sacrificing bonhomie, it is worth noting that the Women Warriors’ last five games were against Suriname, Grenada, Guyana, the United States Virgin Islands and Dominica. Of those, only Guyana—whom T&T downed 3-1—are generally expected to provide respectable opposition against the reigning Caribbean champions. Photo: Trinidad and Tobago winger Shanelle Arjoon tries to escape from a Dominican opponent during 2019 World Cup qualifying action at the Ato Boldon Stadium on 21 May 2018. And it might be saying something that Shabazz was not the only content coach last night. 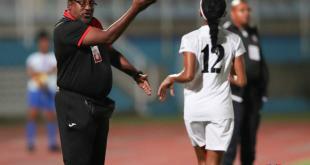 Dominica coach Rajesh Latchoo, a former Trinidad and Tobago women’s youth team coach and assistant to Shabazz at Morvant Caledonia United, also had a satisfied air. 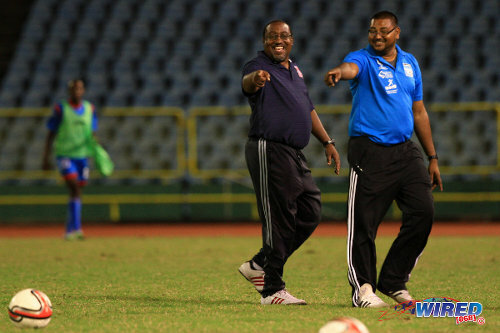 “I thought that [Dominica] were able to keep their tactical discipline,” said Latchoo. “Obviously Trinidad was the superior team we knew what we were coming up against. [But] I am pleased with the girls for their efforts. As always, the truth lay somewhere in between. Dominica started with five defenders and one midfield sentry ahead of them. Yet, three of their remaining four outfield players acted as auxiliary defenders too. The lack of ambition by the Dominica ladies was disappointing but also quite realistic. The visitors did not have a single crack at goal—on or off target—and, if stats were available, they might show that they didn’t even manage 10 percent ball possession. Yet there was something commendable in their grim defending, as the Dominicans threw their bodies in front of shots and forced Trinidad and Tobago attackers down blind alleys. 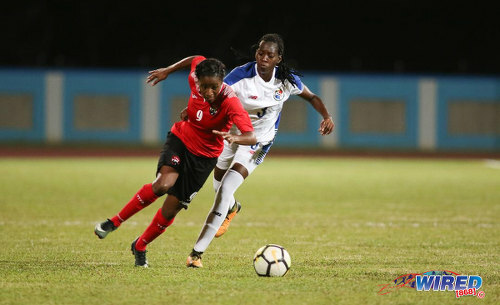 Photo: Trinidad and Tobago captain Tasha St Louis (centre) tries to find space against a resilient Dominica backline during 2019 World Cup qualifying action at the Ato Boldon Stadium on 21 May 2018. 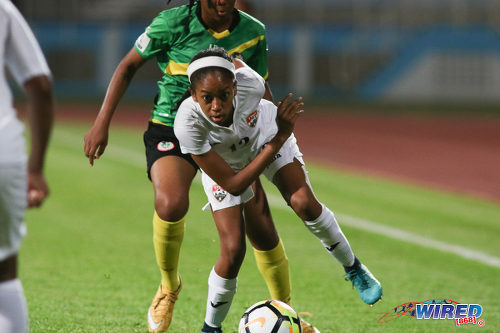 “[Dominica] reminded me of when we would play the United States and were just defending for dear life and trying to get the ball forward to [Ahkeela] Mollon,” said Shabazz. “It was a good strategy. Our players are getting to learn this aspect of the game [and how to] play when an opponent comes and parks the bus. Dominica is an island under repair in more ways than one. Usually, a trip to Trinidad for their team would mean smiling selfies on the stadium pitch, followed by the pain of a double-digit hammering. But after the fury of Hurricane Maria last year, Dominica’s happy-go-lucky spirit has given way to something more resourceful. He made special mention of Dominica’s burly central midfielder, Chazelle Phillip, who was instrumental in denying St Louis the space she needed to bewitch the opposing defence. Photo: Dominica midfielder Chazelle Phillip (right) tries to close down Trinidad and Tobago midfielder Janine Francois (centre) during 2019 World Cup qualifying action at the Ato Boldon Stadium on 21 May 2018. 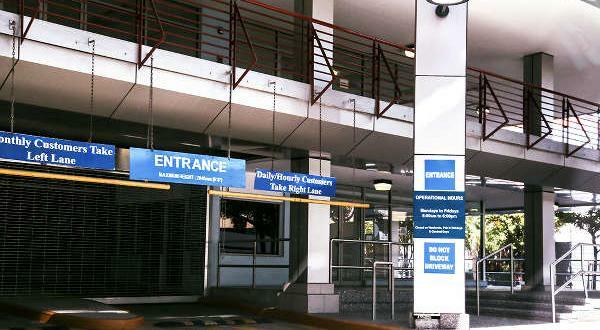 “[Phillip] is from the country and she is one of the girls who has to travel so far to get to practice,” said Latchoo. 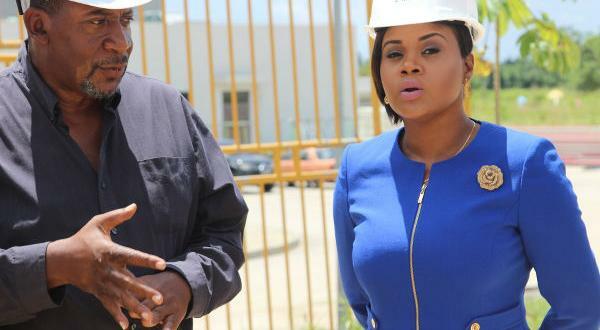 “It it the equivalent of going from Port-of-Spain to Moruga. And remember we are always trying to cheat the lights [so practice can finish in near darkness]. “When she started—well, she’s still overweight—but she has lost a lot of weight. She puts in the work and she makes the sacrifice to make sure she is in training. These girls motivate me to continue working. 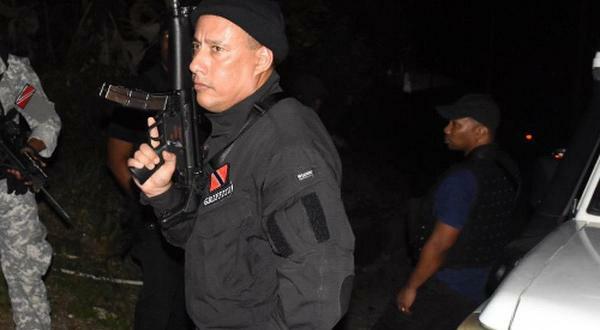 There have been awkward moments between Trinidad and Tobago and Dominica in the last year, as the two-island republic—economic considerations notwithstanding—did not exactly gush with warmth and empathy at the plight of their beleaguered neighbours. But yesterday, for long periods, it was Dominica who denied Trinidad and Tobago free passage to their penalty area. In the end, all three goals from the host team came from set pieces as midfielder Karyn “Baby” Forbes scored directly from a free kick while defenders Jenelle Cunningham and Rhea Belgrave converted after getting on the end of dead balls. 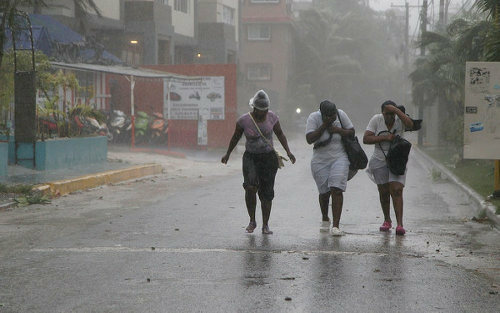 Photo: Women seek refuge in Dominica during Hurricane Maria’s pounding. 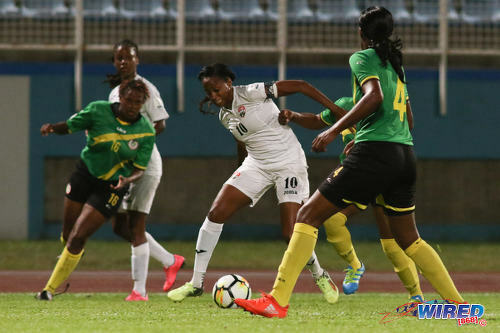 Trinidad and Tobago appeared short of the necessary creativity—and sometimes patience—to open up Dominica yesterday and St Louis and midfielder Janine Francois still look to be lacking rhythm. 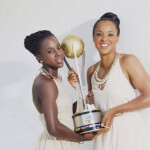 But the hosts’ ball movement was purposeful and the Women Warriors put in a commendable shift. Forbes’ passing with either foot—not to mention her shooting—is worth the price of admission while Belgrave, Russell and wing-back Jonelle Cato did themselves justice. Forward Mariah Shade and nippy winger Shanelle Arjoon did not really deliver the goods but it was not for want of trying. In the post-match media conference, Shabazz beamed while mentioning the talent still to be added to his squad, such as defender Arin King and forward Kennya Cordner. There are also goalkeeper Kimika Forbes, attacker Kayla Taylor, utility player Liana Hinds and versatile twin sisters, Khadisha and Khadidra Debesette. He repeated his call for former captain and midfield organiser Maylee Attin-Johnson and winger Ahkeela Mollon to rejoin the programme too. And he offered a little teaser about two new mystery guests from the United States. Photo: Morvant Caledonia United co-founder and head coach Jamaal Shabazz (left) and then assistant coach Rajesh Latchoo enjoy a good day at the office during the 2013/14 Pro League season. Shabazz’s good mood extended to a playful jab at his sparring partners in the Wired868 Facebook forum. 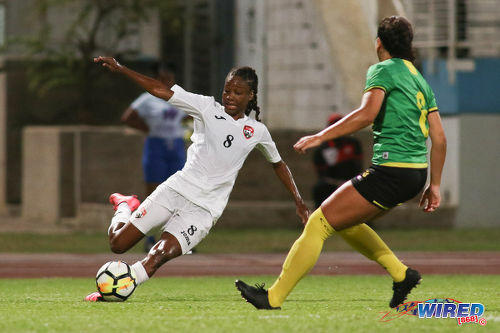 For the good of the Women Warriors, one can only hope that Shabazz’s sunny side survives the tests to come in next month’s final Caribbean qualifying round. For now, Trinidad and Tobago have to face St Kitts and Nevis at the same venue from 6:30pm on Friday. Judging from what has taken place over the past month, the Women Warriors can do with the challenge. Trinidad and Tobago (3-4-3): 1.Saundra Baron (GK); 4.Rhea Belgrave (3.Anastasia Prescott 68), 2.Ayanna Russell, 5.Jenelle Cunningham; 8.Patrice Superville, 11.Janine Francois, 14.Karyn Forbes (19.Aaliyah Prince 70), 7.Jonelle Cato; 9.Mariah Shade (18.Naomie Guerra 78), 10.Tasha St Louis (captain), 12.Summer Arjoon. Unused substitutes: 6.Natasha St Louis, 13.Andrea Young, 15.Taylor Mims, 16.Kedie Johnson, 17.Shaunalee Govia. 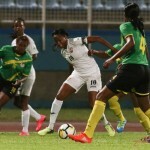 Dominica (5-3-1-1): 12.Kimberly Elei (GK); 20.Alanna Finn (17.Keanna Francis 63), 14.Kylee Bertand, 6.Kira Bertrand, 4.Kimara Sabaroche, 8.Kasika Samuel; 11.Rosilia Registe (captain), 19.Chazelle Phillip, 16.Michlyn Morgan (9.Donisha Xavier 55); 3.Alijah Titre (5.Henrica Samuel 43); 10.Romelcia Phillip. Unused substitutes: 1.Christina Sobers (GK), 2.Myah Raymond, 7.Ezra Elwin, 13.Keandra Francis, 15.Tafari Bertrand, 18.Cassandra Augustine. 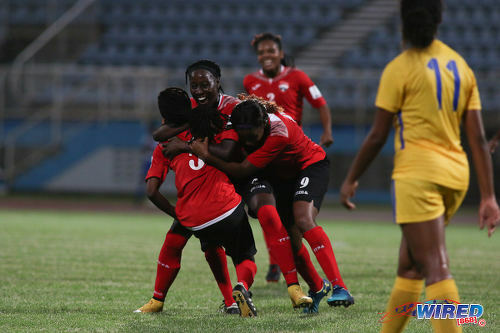 Photo: Trinidad and Tobago defender Jenelle Cunningham (left) is congratulated by teammates Rhea Belgrave (centre) and Mariah Shade after her superb strike against USVI during 2019 World Cup qualifying action at the Ato Boldon Stadium on 19 May 2018. 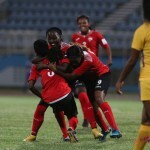 Trinidad and Tobago 3 (Jenelle Cunningham 5, Rhea Belgrave 36, Karyn Forbes 54), Dominica 0 at Ato Boldon Stadium. Photo: Trinidad and Tobago attacker Mariah Shade (left) tries to escape from Panama left-back Maria Murillo during international friendly action at the Ato Boldon Stadium on 22 March 2018. Grenada vs Trinidad and Tobago, 6:30pm, Ato Boldon Stadium. Well done Rajesh Latchoo. Keep up the good work you’re doing with this team! I will back them, win loose or draw. You PROBALLY never went to a local football or cricket match. Christopher Jackson-smith you don’t know me, don’t assume. I am simply saying those teams are the litmus paper for us. I have represented my country in another sphere. I know about T&T Pride. What sphere did you represent the nation? 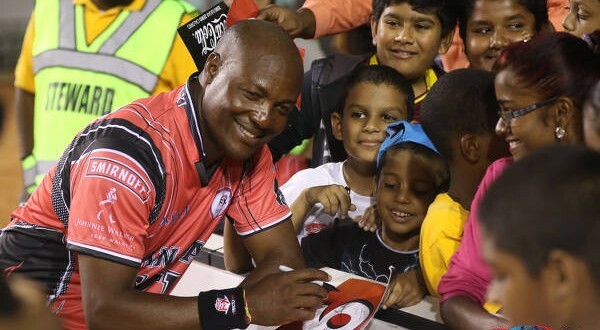 How did you show T&T pride when representing? How did you prepare for below standard challenges? How did you prepare for arduous challenges? What do you recommend to our women footballers when up against Mexico, Canada et. al. ?